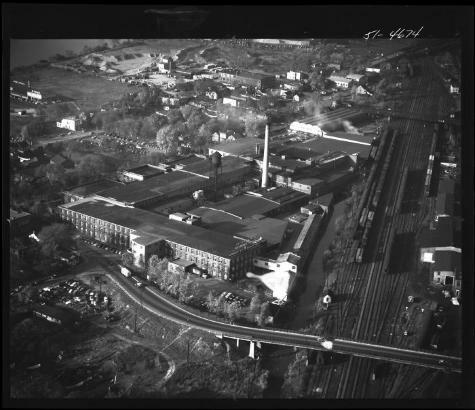 View north of a factory owned by Kenwood Mills, a manufacturer of paper and fabrics. New York Central Railroad's main line is on the right, and the Hudson River is in the upper left. An overpass over the railroad is in the foreground. The location is unknown. Source: New York State Archives, Aerial photographic prints and negatives of New York State sites, 1941-1957, B1598-99. Box 5, no. 63.